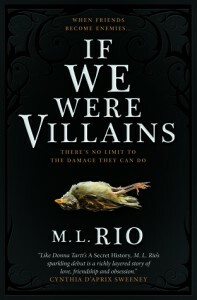 If We Were Villains... - Liz Loves Books.Com. Because I am huge fan of Shakespeare and all that entails this book worked for me on every level. I lived this book and loved it. It is a homage to the bard and of course an atmospheric, beautifully layered and indomitably emotional story in its own right. The comparisons to The Secret History are for once quite valid, but shoot me if you like, I much preferred this. I'm not a fan of Tartt's overly pretentious and self absorbed writing style that lacks any sense of editing, its not that I didn't enjoy The Secret History I did, but it banged on interminably at times taking 5000 words to get as much depth into the action as M L Rio manages here in mere paragraphs. So as a very subjective thing for me this was much better. Plus I should probably say its similarities are less than its differences so any comparisons made are on the surface. I read it in 4 hours today stopping only for caffeine hits and got entirely caught up in this insular, elite and yes pretentious world of a group of theatre students whose friendship, love and obsession leaks off the stage and into their personal interactions. The author uses Shakespeare both allegorically and practically - the language they speak, the way they form ties, its all beautifully written and stunningly addictive. The last paragraph shot me off my chair, so perfectly clever was it, having been lulled into the ebb and flow of a novel that seemed to be done with me at that point suddenly going ha ha NO now you will think of me always. And I will..